I love this time of the year. Vegetable gardening is at the top of my list of things to come. The temperatures keep teasing us that spring is on the way, and our thoughts are often on the garden. Unfortunately, for many, it’s far too early to actually plant seedlings or seeds in the ground right now, in case we get more frosts or otherwise cold weather. 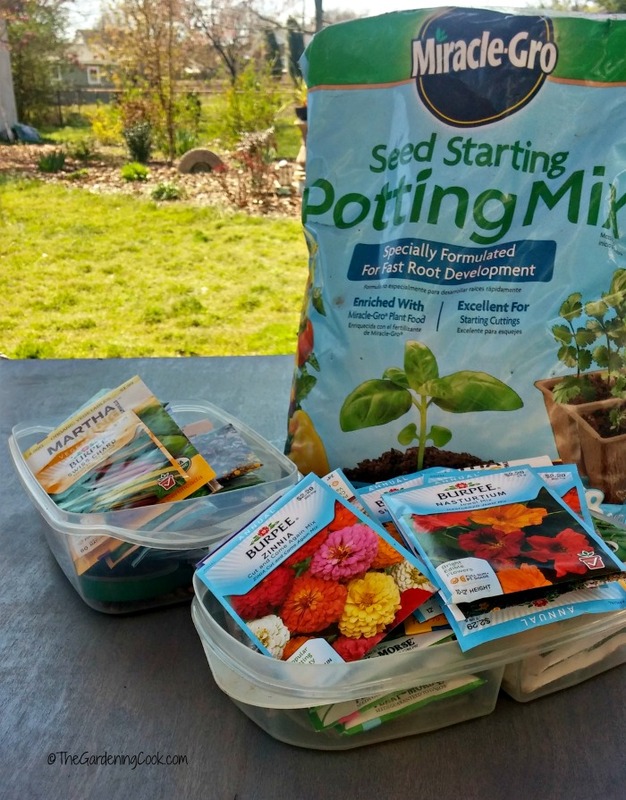 These frugal seed starting pots and containers make use of household items and do the job of starting seeds for annuals and perennials just fine! These frugal seed starting pots and containers make use of items around the home that can be re-purposed into containers to start your seeds for spring. If you have a large garden, or a big collection of indoor plants, it can be very expensive to buy seedlings or small varieties of every type of flower or vegetable that you might want to grow. This is where starting seeds can be a huge money saver. Just think of the money you would have to spend on a bunch of pots, peat pots, or pellets the size that you need! But this does not have to be the case. Sometimes the answer is just to look for household items that are the size that you need. Just raiding your recycling bin may give you all the pots that you will need to get going. This looks like a big basket of junk but everything here can be used for planting seeds. So gather those seeds, get our your seed starting soil and get planting the inexpensive way. Here are a list of 10 of my favorite frugal seed starting pots and containers that won’t break the bank. 1. 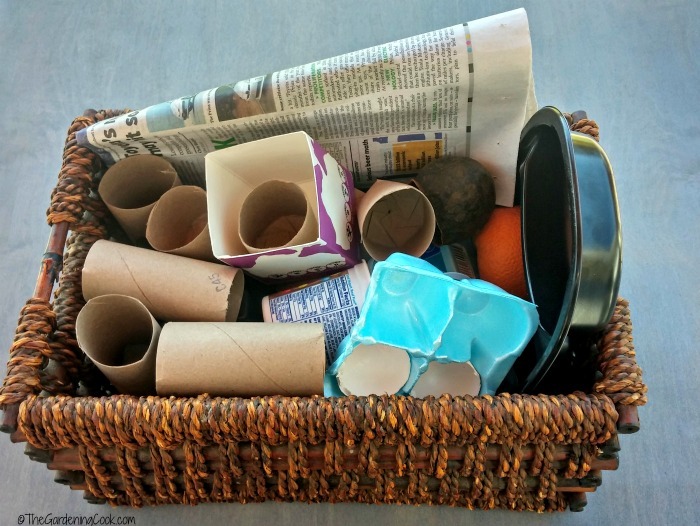 Make your own paper pots. 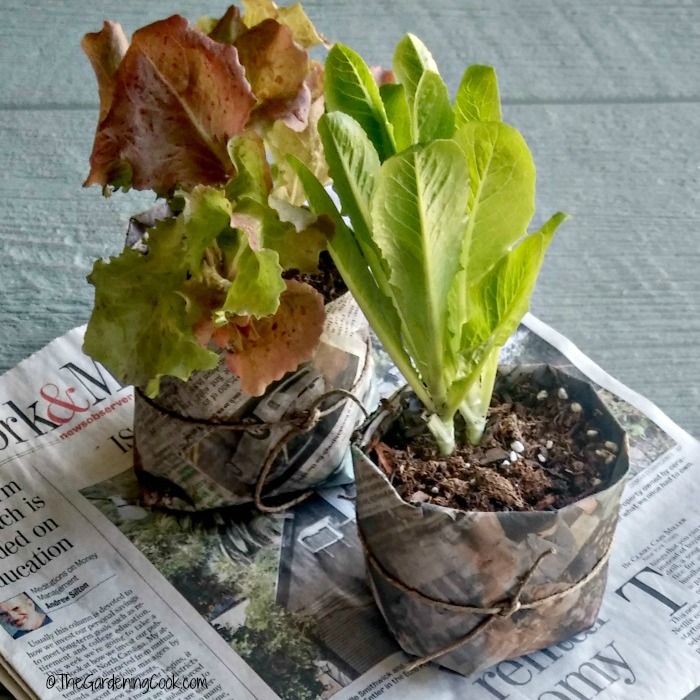 All you will need to do this in some used newspaper, a glass with straight sides and some tape and seed starting soil. See how I made mine in this tutorial. 2. Scooped out Avocado shells. So many items that normally make it to the trash can be used to start seeds. Avocado shells are a great example. Just scoop out the flesh from 1/2 an avocado, poke a few holes in the bottom and fill the shell with seed starting soil mix. Plant two or three seeds in the soil and thin to the strongest later. The whole shell with seedling can be planted right into the ground when it has grown a bit and the weather has warmed up. 3. Yogurt Containers. 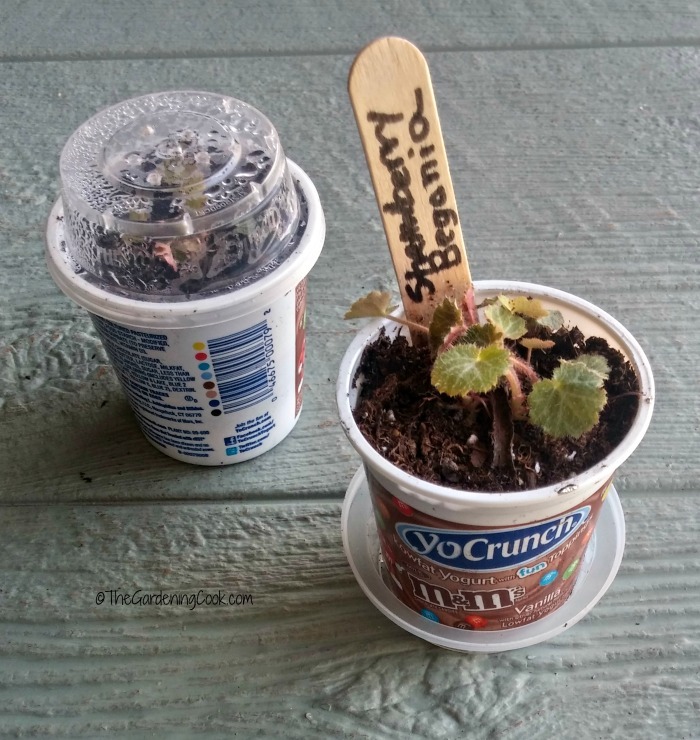 Individual sized yogurt containers are the perfect size for frugal seed starting pots. I like to use the ones that have a clear plastic domed top, such as these YoCrunch containers with M&Ms. They will hold some of the larger seedlings and the domed top acts as a mini terrarium before the seedlings sprout. Just remove it after they start growing. Be sure to poke holes in the bottom of the container before you add the soil for drainage. 4. Egg Shells. I love this idea. Using egg shells not only gives you some great frugal seed staring pots, but the whole thing can be planted into the garden and the shell will add nutrients to the soil around it. Just crush the shell gently at planting time and peel off the very bottom for the roots to grown down. 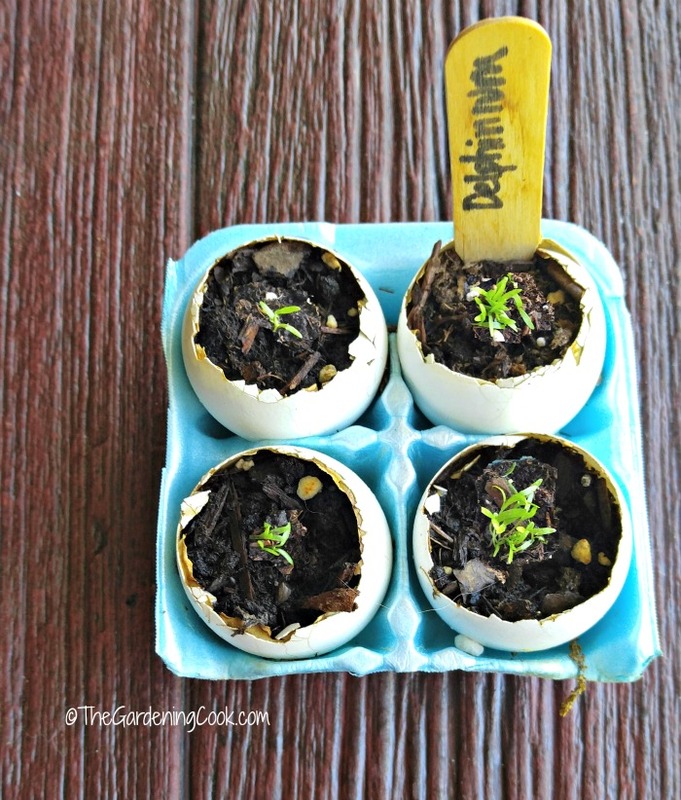 One egg will give you two tiny pots (suitable for very small seedlings such as thyme and other herbs, or it will give you one larger pot. Just rinse the shell after you remove the egg. I used a pair of Cutco kitchen shears to trim the edges of the egg shells a bit. An old egg carton makes a perfect holder for the pots too! 5. Jello cups. Individual sized Jello and pudding cups are the perfect size for small seeds. They hold about as much soil as the black seedling holders from a garden center. 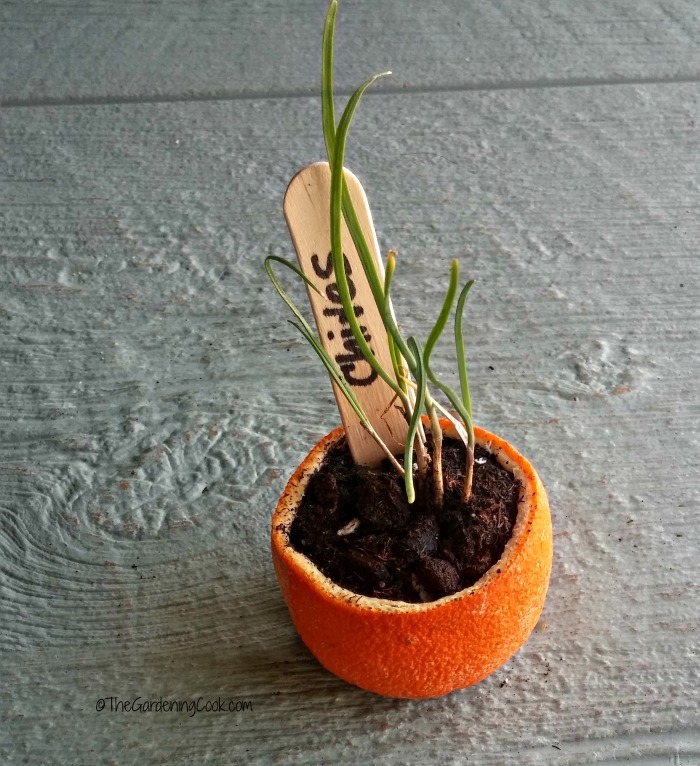 Just poke some holes, fill with soil and add a few seeds and thin to the strongest when they start growing. At planting time, remove the soil and plant in the garden. 6. Citrus rinds. Cut about 1/3 of the top of an orange, lemon or grapefruit off. I used a serrated grapefruit spoon with a curved edge to remove the fruit and membranes. Wash the inside and poke a few holes and fill with soil and plant. At planting time, cut the bottom off and plant the whole thing into the garden. 7. Gift wrapping paper rolls. Who knew that a gift wrapping paper roll could do double duty in the garden? One roll will make two pots. Just cut it in half and then make six slits about 3/4″ long on the bottom edge that can be tucked in under each other in a circular fashion and fastened with tape. At planting time unfold the bottom and plant the whole thing. It will slowly disintegrate and the roots can grow down through the bottom. One regular sized roll will make about 9-10 frugal seed staring pots. You can also do this with toilet paper and make two pots out of each roll. 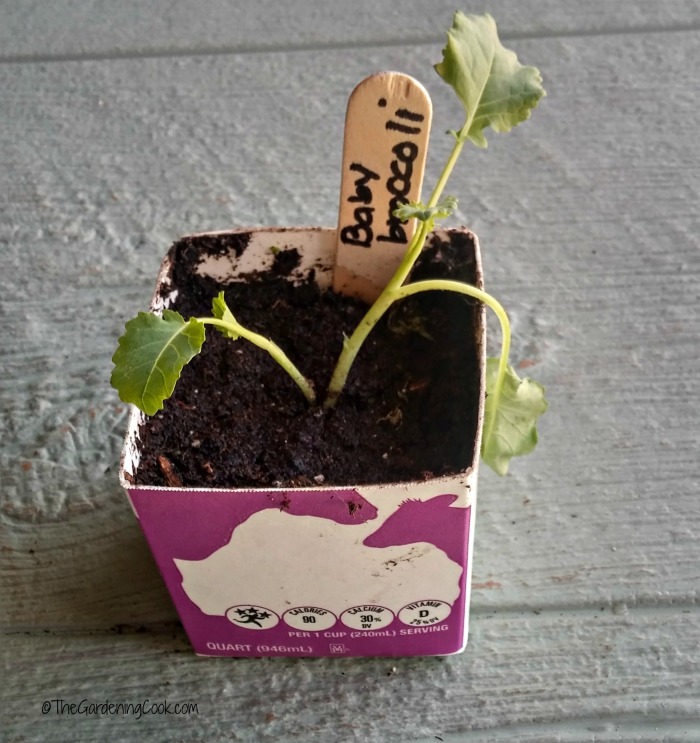 Be sure to label your plant pots with some plant seed labels so that you know what they are when they start growing! 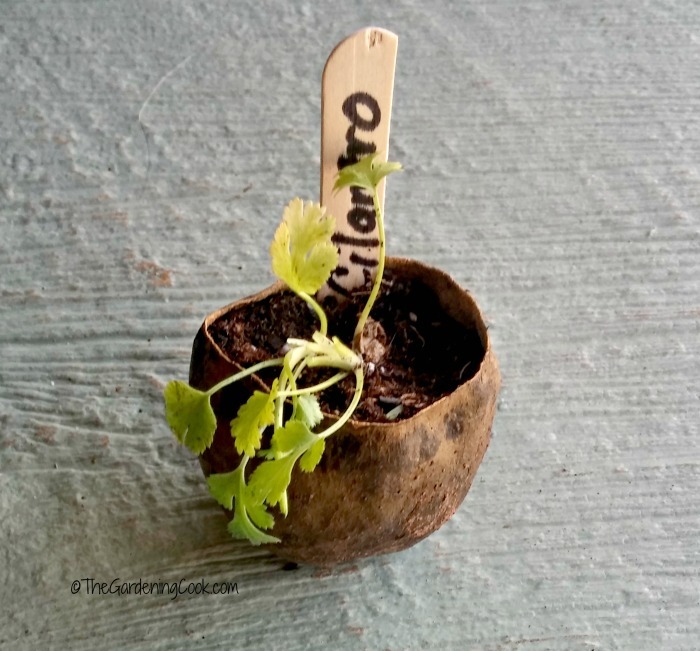 See my tutorial to make the gift paper seed pots here. 8. Egg Cartons. All egg cartons will work. They are best for fairly small seeds, since the size of each compartment is quite small. The plastic coated ones will need to be cut away at planting time. The cardboard egg cartons can be planted right into the ground. Just cut the bottom off for the roots to grow. They will degrade slowly and earthworms LOVE cardboard. 9.Milk Cartons. 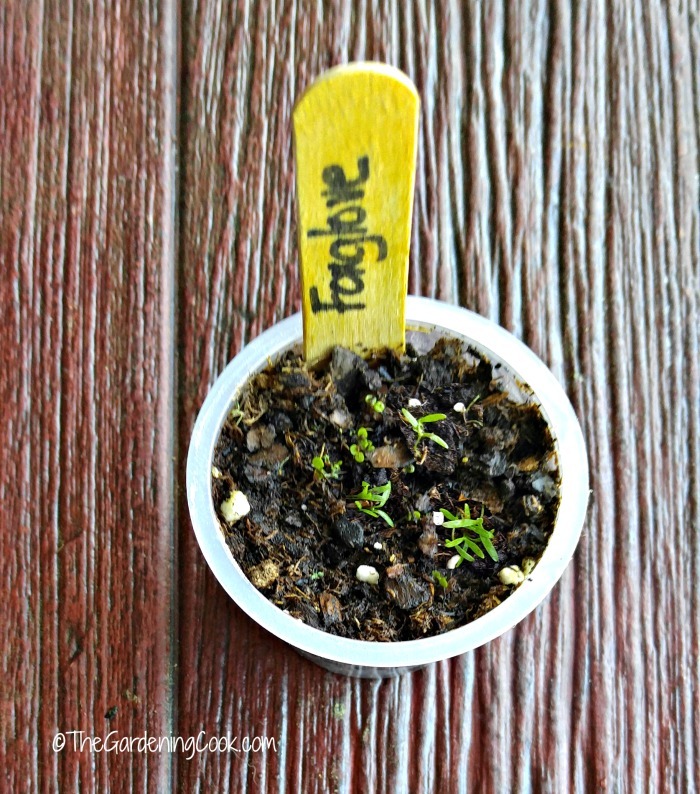 Quart or pint sized milk cartons are perfect for starting larger seeds. They have a plastic coating so they won’t “weep” when watered. Be sure to add some drainage holes and add potting mix and seeds. One quartz sized carton can be cut off to about 3 inches high and will hold a larger plant such as a tomato, broccoli or cabbage seedling. 10. Frozen food meal tray. These are more of a plant tray than a pot. This one even has a side area to keep plant labels and a marker! 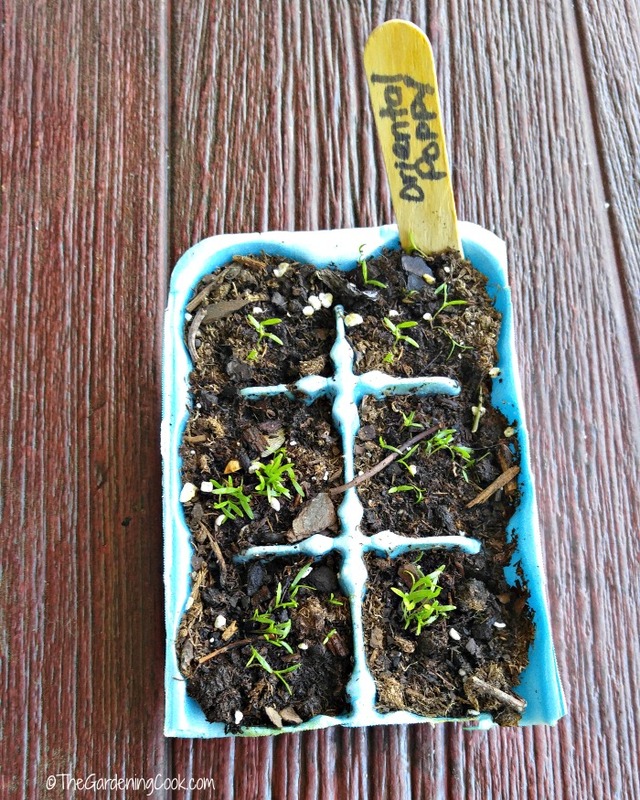 I keep my old garden center seedling trays from year to year and place re-use them. The frozen food trays are just the right size to hold the four seedling containers. 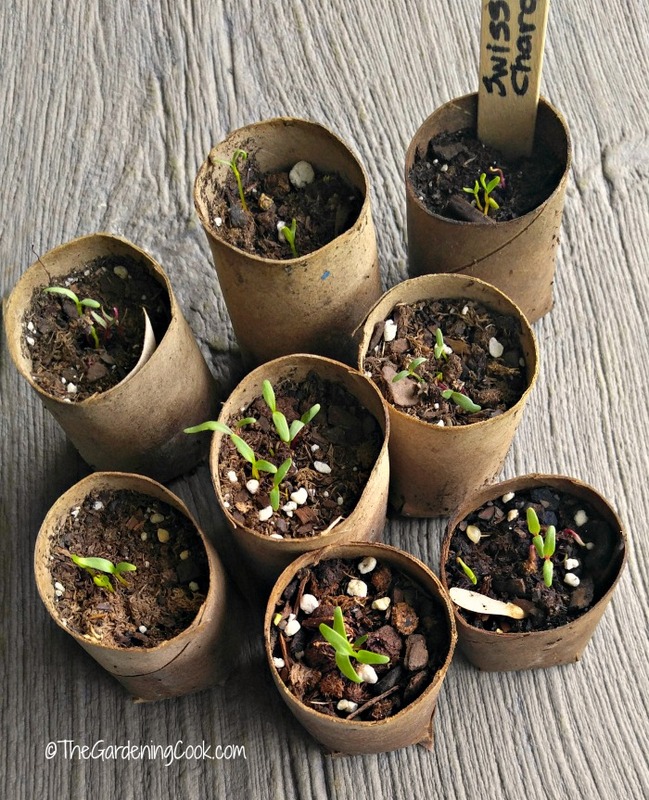 These ideas for frugal seed starting pots will let you skip those expensive peat pots and pellets. The money you save can go to the purchase of more seeds instead! If you enjoyed this article, be sure to check out this one too. I show how to use a rotisserie chicken container for seed starting. 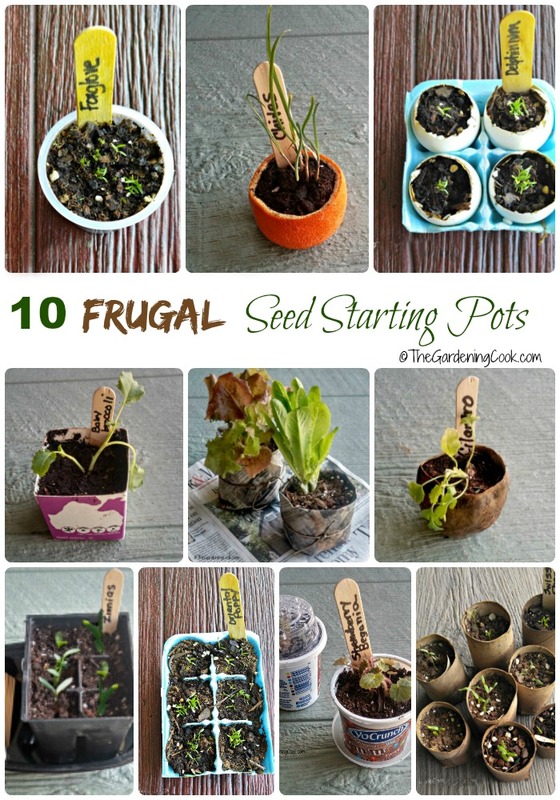 Do you have a suggestion for some frugal seed starting pots that I have not mentioned? I’d love to hear your ideas in the comments below. Awesome. awesome, awesome. Thank you for sharing. We have the most stunning indigenous plant species in South Africa and I’m always looking for ways to seed them. I love all these organic methods like the avocado!! Hi Heather, What I like most about them is that most of them go straight into the ground and add nutrients to the soil. 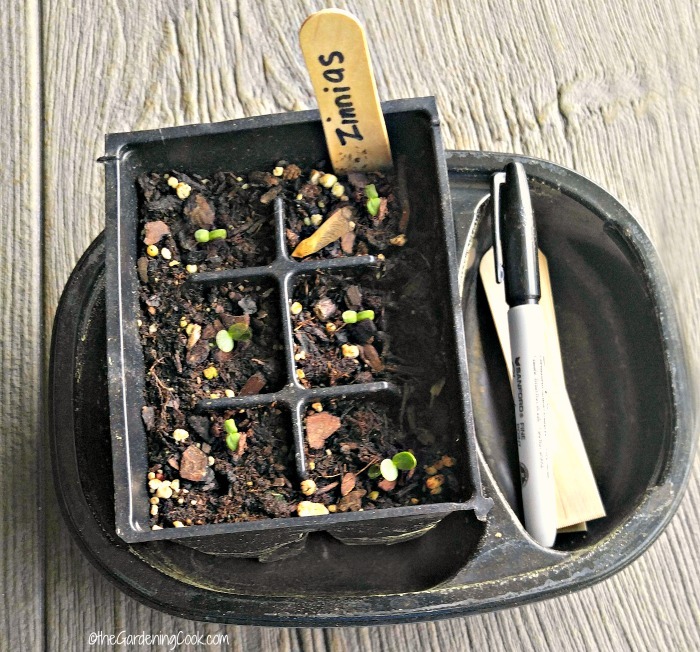 Some great ideas here for seed starting! These are all great ideas Carol! This year is the first year that I started my own seeds in a long time. The hubby bought me a little greenhouse. To buy plants they are soooo expensive now. I remember paying around 29 cents for a tomato plant and there was usually 2-4 tomatoes in the little pot. Now their close to $4 a single plant. This year I bought the 6 pack plant starter pots, but next year I will have to try some of these. Thank! Found your article interesting as I use most of the items already, with the exception of citrus and milk cartons. I bought several small sauce containers and use them as starters for small seeds, with vermiculite as the ‘soil’. I also use a cakebox (opaque base and transparent sides and top) as a mini greenhouse. It has a raised ridge on the base and when I slot the top in, I have a reasonably airtight greenhouse. Thanks Rogan. I like your idea of the mini greenhouse.